It has been a busy year for the world’s top diplomats: flying across European capitals to discuss the Syrian conflict, dealing with an increasingly aggressive Russia, and gathering in New York for a major summit convened by US President Barack Obama on international migration. It would be understandable if the busy world of international security had completely overlooked the Habitat III conference, a United Nations meeting on global urbanization that gathers only once every two decades. Yet Habitat III, which took place in Ecuador from 17-20 October, produced a number of promising policy ideas with potential to benefit billions of people living – and about to move to – cities in our rapidly urbanizing world. Don’t look for any detailed mention of an international security crisis at Habitat III. Instead, the conference’s contribution to global security has been the New Urban Agenda , a document with the goal of guiding global urbanization practices and debates for the next 20 years. It marks a significant shift from previous documents in that it directly links urban development with the need to pay “special attention” to countries undergoing post-conflict transitions. Even more promising is the pledge to “integrate inclusive measures for urban safety, crime and violence prevention’, including terrorism, “in developing urban strategies and initiatives”. Whereas this call may seem slightly vague – nothing new for the UN – it does serve a practical purpose: it calls on security and urbanization strategists to talk to each other. These two estranged communities might initially see this as odd, but it has become indisputable that the way cities develop has a huge impact on security. The New Urban Agenda, therefore, has the potential to promote new ideas and policy tools for global security. That is because cities are almost always absent from the high-flying world of international peace and security summits, but are tasked with applying many of their policy recommendations. The answer is no, although the UN and many military forces, strategic thinkers and humanitarian practitioners have recently strived to better understand the implications of rapid and unmanaged urban population growth in the developing world, particularly in Africa and Asia. 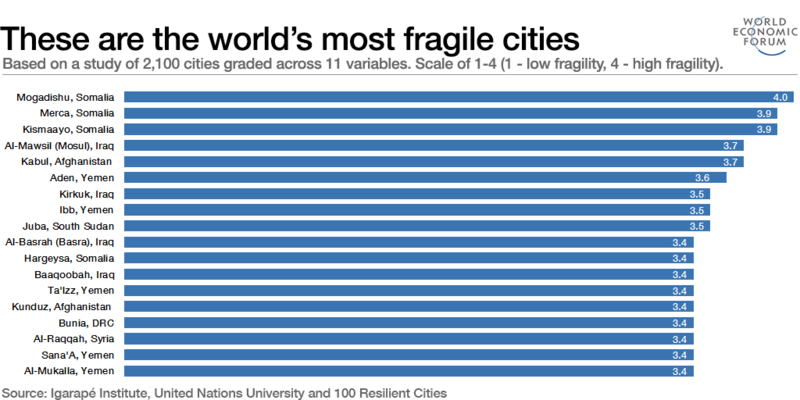 Some of the world’s most underdeveloped and fragile countries are also facing the most rapid urbanization. Sub-Saharan Africa, which currently hosts nine out of 16 UN peacekeeping missions, is forecast to triple its urban population by 2050. The default policy toolbox for military strategists and international security experts tend to involve old approaches such as air strikes, laying siege to cities (the current strategy in Iraq) and counter-insurgency. Now imagine if a new stream of strategy and security thinkers can draw from urban development, planning and technologies to make it harder for non-state armed groups to operate in cities. This is the potential of the New Urban Agenda. The same reasoning – that a local approach can make a difference in responding to armed conflicts – underlined the launch , earlier this year, of the Global Alliance for Urban Crises, a partnership between 65 organizations wanting to better plan, prevent and respond to urban conflicts and displacement. Equally, the nexus between urbanization trends and conflict has prompted the International Committee of the Red Cross to become intensely involved in the negotiations for the New Urban Agenda, publicly calling for the world’s urban leaders and thinkers to “remember the millions of people living in urban violence”. As policy-makers look to cities for new tools to tackle armed conflict, it is important to remember that urban solutions helped alleviate some of the most protracted security crises in Latin America – a region where approximately 80% of people live in urban areas. Medellín , in Colombia, combined military and law enforcement operations with libraries, cable cars and architectural works in marginalized communities to regain control of slums previously dominated by leftist guerrillas, right-wing paramilitaries and criminal groups. Rio de Janeiro has tried a similar approach, with some success – for example, the Brazilian city was able to reduce gang control over key slums, paving the way for the Olympic Games. These urban tools have the potential to tackle a growing security trend that I call disputed peripheries. These are areas right in the middle of large and mega-cities, sometimes capitals, that, despite their economic and political significance, lie outside state control. From there, armed violence and illegal economies (not only drugs but arms trafficking, extortion and kidnapping) spill over to the broader urban system or link up with armed conflicts taking place in nearby regions. A look at the largest cities located near ongoing armed conflict reveals the two-way relationship between unmanaged urbanization and conflict. The Kenyan capital of Nairobi, next door to the ongoing Somali conflict, has had difficulty managing the challenges of Islamist radicalization and al-Shabaab presence amid its 130 slums. Slums hosting large numbers of Somali refugees have become recruiting grounds for the extremist group al-Shabaab. This is especially bad news for the slum dwellers themselves: they suffer not only from the lack of basic state services and security but also from brutal raids conducted by security forces. The nexus between terrorist recruitment and bad urbanization in Nairobi seems clear: slums have become increasingly dense, unmanageable and therefore harder to govern and secure. Whereas the slum population in 1971 was 100,000, by 2009 the estimate was close to 2 million – making up over half of the city’s total population but occupying just 5% of the residential space. Pakistan’s largest city, Karachi, which is responsible for 35% of the country’s tax revenue, has served as a critical hub connecting the conflict economy of Afghanistan (mainly opium) to a global consumer market. The city has faced decades of unmanaged growth, driven to a large extent by refugees fleeing nearby violence – more recently in Afghanistan and in Pakistan’s tribal areas. Its population has increased two-fold between 1998 and 2014. This unmanaged urbanization has further strengthened the ties between Karachi and neighbouring conflicts by providing breeding ground for armed groups: ethnically aligned groups battling each other, internationally-linked militants and an estimated 200 gangs. Urban growth is not a cause of armed conflict. But it does link to, and sometimes feed into, conflicts happening around large cities. Of course, if the urban environment is part of the problem, it can also be part of the solution. One strong step being taken by the international organizations and governments behind the New Urban Agenda is to focus on the long-term relationship between conflict and urbanization. Last year the International Committee of the Red Cross released a ground-breaking report on the cumulative impacts of conflict on urban services, highlighting how intense armed conflict in cities gradually degrades water, electricity and other vital services, causes brain drain, reduces budget, harms health and causes long-term systemic damage. If left unaddressed, urban deterioration hampers the ability of regions and countries to recover, which can in turn further feed the flames of conflict. As Nairobi and Karachi demonstrate, migration is both inherent to cities and a potential risk – if left unmanaged. This is another area in which urban planning and leadership can be put to good use to avoid the splintering of cities into disenfranchised neighbourhoods, ghettos and disputed peripheries. David Miliband of the International Rescue Committee has argued for specific measures to address the huge number of refugees currently fleeing to cities (rather than camps) from Syria, in order to alleviate services and infrastructure in strained municipalities such as Istanbul. Going back to the positive example of Colombia, the substantial success achieved by the governments of the past decade or so in recovering urban territories from armed groups has been crucial in scaling down ongoing conflicts and preventing their spread. The recovery of key urban spaces has denied these armed groups key trafficking routes and income, while freeing government resources to take on guerrillas and paramilitaries elsewhere. Luckily, the New Urban Agenda makes several points that will allow for a useful exchange between international security and urban practitioners, especially on urban services during conflicts, post-conflict recovery and urban refugees. This is a timely alignment that strategists on both sides should leverage to expand the toolbox in a rapidly urbanizing world.